A message of love, compassion and the spiritual unity of humankind from one of India’s visionary teachers Vivekananda’s message gives us hope for the future. His love for humanity gave him the mandate for his message, and his innate purity gave him an irresistible power that nobody could match. The same love that was born as Buddha, the Compassionate One, once again assumed human form as Vivekananda. —from the Introduction At the World’s Parliament of Religions in Chicago in 1893, a young Hindu monk caused a sensation. At the utterance of his simple opening words—“Sisters and Brothers of America”—the audience broke into spontaneous applause for Swami Vivekananda. What followed was a stunning speech about the validity and unity of all religions. In just a little over a century, Vivekananda’s message has spread throughout the world. In this book for spiritual seekers of all faiths and backgrounds, and for all who yearn for solutions to the ideological conflicts that threaten our world, Swami Adiswarananda presents a selection of Vivekananda’s most profound and inspiring lectures and an intimate glimpse of his life through newspaper reports from the time, personal reminiscences from disciples and others close to him, and impressions of his life and message from world leaders. 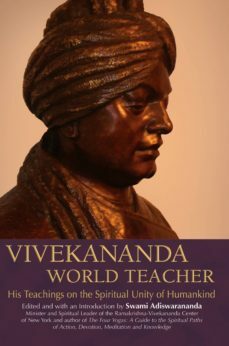 A chapter by Swami Nikhilananda, founder of the Ramakrishna-Vivekananda Center of New York, offers a fascinating view of Vivekananda’s spiritual mission to America—a mission that brought the ideals of spiritual freedom and spiritual democracy to the forefront of Western religious thought.